Examine the Bible's most powerful verses---and find a dynamic description of God's presence as he goes with you in the world! Illustrating how God spoke through the patriarchs, poets, and prophets of the Old Testament, and then through Christ and his disciples, the Rabeys demonstrate how God constantly communicates to his children today. 256 pages, hardcover from Warner Faith. Through an examination of the Bible's most powerful verses, the newest installment in the 101 Most Powerful series reminds us that we are not alone in this world. In the Old Testament, God spoke through patriarchs, poets, and prophets. In the new Testament, he reaches out through Christ and Christ's disciples. Highlighting some of the key verses of the Bible, Steve and Lois Rabey demonstrate how God constantly communicates his will and his love to his children. 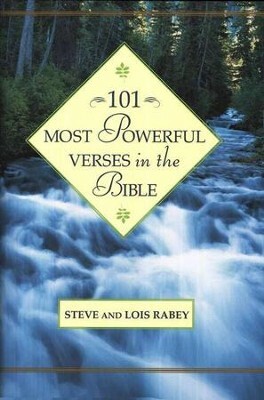 101 Most Powerful Verses in the Bible is a devotional book containing 101 two-page devotionals by the husband and wife writing team, Steve and Lois Rabey. The fourth in the series, this book follows 101 Most Powerful Prayers in the Bible, 101 Most Powerful Promises in the Bible, and 101 Most Powerful Proverbs in the Bible. As an author, its an idea I wish Id have thought of. In 101 Most Powerful Verses in the Bible, Steve and Lois Rabey wove devotional applications from their own life experiences with select verses from nearly every book in the Old and New Testaments. Peppered throughout are the devotional thoughts of great thinkers like Frederick Buechner, Dietrich Bonhoeffer, and Saint Bernard of Clairvaux. I'm the author/artist and I want to review 101 Most Powerful Verses in the Bible.